I went to his very splendid birthday celebrations at Goodwood motor-racing circuit recently where the star of the show – apart from my mate – was his newly-unveiled, and now magnificent, gleaming red 1930 Alfa Romeo convertible. I’ll spare his blushes by not revealing what he spent on it. Suffice to say, any discussion of the restoration project was best conducted out of earshot of his long-suffering wife. Luckily for him the value of collectors’ cars has rocketed in recent years. Once he’s over the thrill of actually driving his new toy he should be able to sell it at a modest profit and buy himself any number of more practical classics. One family which has done just that are the owners of Headlam Hall, a country house hotel, and the Rose & Crown, a traditional inn, in the glorious countryside of Teesdale. Their personal collection includes two 1970s Jaguar V12 E-Types – one a coupe and the other a convertible – a 1981 Mercedes SL and 1976 Porsche 911. For added peace of mind there’s an excellent classic car garage nearby for more complex repairs. But if you’d rather simply hire a fun car, guests at both hotels can slip behind the wheel of the E-Type coupe at a daily rate of £225 (£275 weekends). 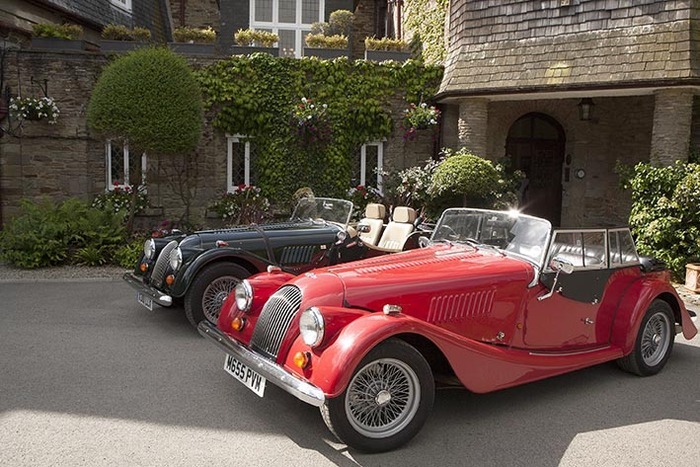 Janet Simpson, proprietor of Gibbon Bridge Hotel, in the North-West’s Forest of Bowland, is a great veteran car enthusiast and her hotel is another favourite among car clubs. Often taking pride of place in the car park is Janet’s own elegant 1938 Derby Bentley – in which she drove along the West Coast of Australia a few years ago. A bit farther north, Linthwaite House in Windermere can arrange for guests to rent a range of interesting motors. These include various Jags – including an E-Type – a Triumph Stag and Sunbeam Alpine. Rental prices start at £295 a day. If you enjoy roof-down motoring but prefer a modern classic, a Morgan two- or four-seater convertible might be just the job. Budock Vean Hotel, on the banks of Cornwall’s Helford River, can arrange either at a cost of £175 for one day or £310 for two days.